Buying a car in Georgia is not a straightforward service. You must obtain the required paperwork from the seller to register and title the newly purchased car in your name. If you buy a car from a dealer, they will handle all the required paperwork on your behalf. However, buying it from a private seller, you will be responsible for submitting the required documents to the Georgia Department of Revenue (DOR). Continue reading this article to get more information about the paperwork required when buying a car in Georgia. The seller fills the appropriate sections of the title.There is odometer reading on the title for vehicles less than 10 years old. The title is signed by you and the seller. You also need to obtain a bill of sale from the seller. NOTE: If you purchase a car in metro Atlanta counties, you must take it for emission inspection before registering it. In Georgia, vehicle titles are not required for vehicles manufactured in 1985 or older. You only need the bill of sale for such vehicles. So be sure to take the bill of sale with you to your local Tax Commissioner’s office. For vehicles newer than 1985, the bill of sale might still be used to register a vehicle in place of a title. To be on the safer side, ask the seller to apply for a replacement title before selling the car. If the registration papers are missing, contact the law enforcement officers to inspect the vehicle identification number (VIN) and the vehicle itself. 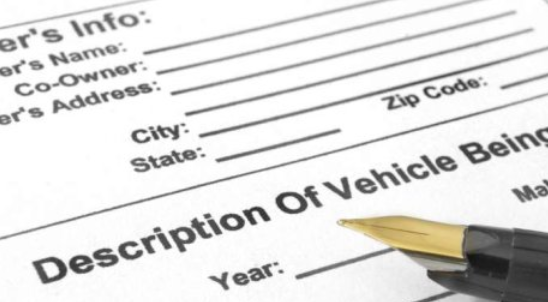 With these documents, you will be able to register the vehicle in your name. A bill of sale is needed when registering the car in your name. A completed Form MV-1 (Motor Vehicle Title/Tag Application). $5 License plate transfer fee. Sales tax which vary with the purchase price. There are penalties for late registration. So, make sure you finalize registration and vehicle transfer within 7 days from purchase date. A vehicle history report is needed before vehicle purchase. This report contains details such as odometer reading, damage history and accident history. Make sure information in this report is correct to avoid becoming a victim of frauds, such as odometer fraud. Even though this report is not needed as part of required paperwork, you need this document if you are buying used vehicles.